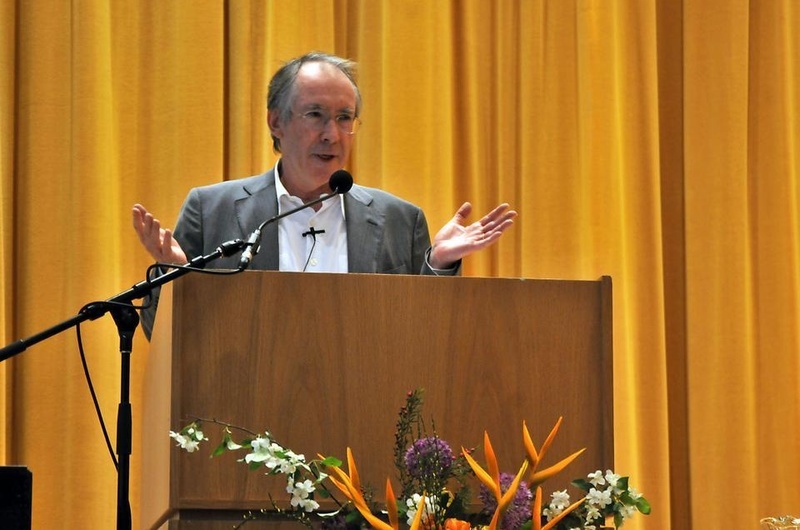 British novelist Ian McEwan delivers his lecture “The Lever: Where Novelists Stand to Move the World,” at the inaugural Rita E. Hauser Forum sponsored by the Mahindra Humanities Center. Ian R. McEwan, the acclaimed author who penned, among other works, “Atonement,” quoted Archimedes in his talk at the Mahindra Humanities Center on Tuesday. Archimedes’ declaration—alluded to in the lecture’s title, “The Lever: Where Novelists Stand to Move the World”— was McEwan’s jumping off point to talk about the use of realism in his work. In the lecture, McEwan emphasized his dedication to realism as one of the defining features of his work. Throughout the lecture, McEwan read passages from his novels and letters from readers who pointed out fallacies in his works. McEwan described a scene from his 1981 novel, “The Comfort of Strangers,” in which he describes one of his characters observing the constellation Orion in the Italian summer sky—an impossibility, since Orion cannot be seen from the northern hemisphere in the summer. “If you want to see Orion during the summer you must go to New Zealand,” a reader wrote to McEwan. After the lecture, McEwan said that his goal for the talk was to shed light on the life of a novel from the perspective of an author. —Staff writer Maya S. Jonas-Silver can be reached at mayajonas-silver@college.harvard.edu.